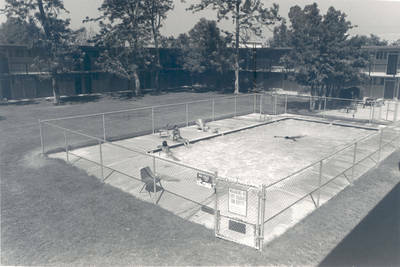 "Swimming pool, Cheverton Residence Hall [originally East Hall], Chapma"
Swimming pool for Cheverton Residence Hall [originally East Hall], Chapman College, Orange, California, ca. 1978. The dormitory was dedicated in 1959 as housing for women and torn down in 2002.